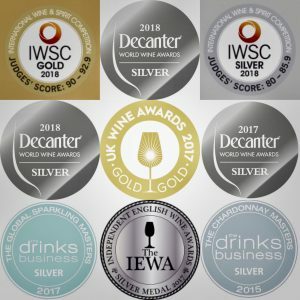 We are very proud of the awards that our wines have won. It is always thrilling when people write nice things about our cuvées. 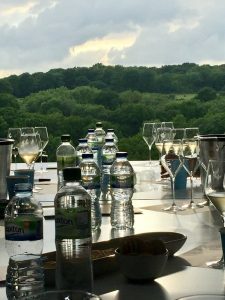 That ranges from Golds & Silvers & high scores in Wine Competitions, to positive comment from Masters of Wine, Wine merchants & wine journalists, all the way to emails from people who have just enjoyed a bottle of our fizz in a restaurant and wanted to tell us about it. But we don’t make wines in a particular style in order to win awards. We enter as a means of benchmarking ourselves, checking our quality and consistency from year to year. Sometimes, we also aim to challenge the consensus, for instance with our avant-garde Pinot Gris driven cuvée Inspiration, or our Saignée Rosé Expression and most recently our enticing Meunier Brut 2014. Awarded Gold by Tom Stevenson”s CSWWC 2018 Panel. Awarded Silver by Decanter World Wine Awards 2018. DWWA 2018 Tasting Note: Citrus nose with hints of sweet pastry and light autolysis. The palate is well put together and defined, with exemplary length, 90 points. Decanter 2018 Tasting Note: Very young and vibrant with a mineral steeliness on the nose and a tense palate. Finishes well with some grip too. Glass of Bubbly Magazine (Issue 14): This is a beautifully balanced wine, full of charm and refreshment. There’s a lovely honeyed citrus zest to the finish that makes the most of its enticing fruit flavours. John Mobbs of Great British Wine: Golden tones, honeyed stone fruit & angular acidity. A brilliantly poised Pinot Gris based English Sparkling. Anthony Rose MW: Pale coppery bronze, attractively fresh nose, with a hint of nuttiness, nicely intense, fresh, full bodied & flavoured fruit, with complexing nutty background notes and tangily crisp dry finish. Glass of Bubbly Magazine (Issue 14): Small bubbles create a rich mousse that offers ripe apple and a subtle hint of peach on the first taste with a long refreshing finish. This wine is primarily Pinot Noir grown at the Lakestreet vineyard with a light touch of Pinot Meunier to add roundness and suppleness. The result is an elegant wine that is easy to enjoy. Matthew Jukes, Daily Mail March 2018: With a creamy palate and smooth, honed fruit, the 2013 Mayfield Tradition Blanc de Noirs – made from pinot noir and pinot meunier – is lovely and harmonious. Glass of Bubbly Magazine (Issue 14): Raspberries, red currants and a whisper of pink grapefruit, combine to make this an enthralling rosé, rich and refreshing. Pinot Noir characteristics take centre stage. Chardonnay, Pinot Meunier and a dash of Pinot Gris add balance and zest. This gloriously coloured rosé was made in the saignée method with skin contact from the Pinot Noir. What a nose! This aptly named wine is expressive with rich aromas of ripe red fruit in the form of cherry and strawberry. The palate opens with crisp citrus and tangy red berries, but it’s not all about the fruit! Hints of candy apple and pastry add complexity and intrigue. Packed full of character; a weighty hug with a pleasingly dry finish and return of those warming red fruit notes. 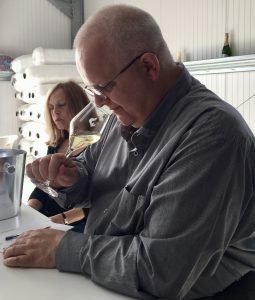 John Mobbs of Great British Wine: On the nose, this sparkling wine has a purity and honesty that just speaks Chardonnay from the first smell. Clean green apple and citrus and the slightest hint of brioche. To taste, the charisma continues with a direct and focussed tangy green apple bite. Supercharged zesty freshness and brilliant acidity, but it doesn’t dominate. Then a supple, silkier mid taste that seamlessly integrates with hints of sweeter suggestions of caramel or toffee apple. Simply delightful! SORRY, THIS VINTAGE IS NO LONGER AVAILABLE, YOU MIGHT LIKE TO TRY INSPIRATION BLANC DE BLANCS 2013.